The exhibition match between Valletta F.C. 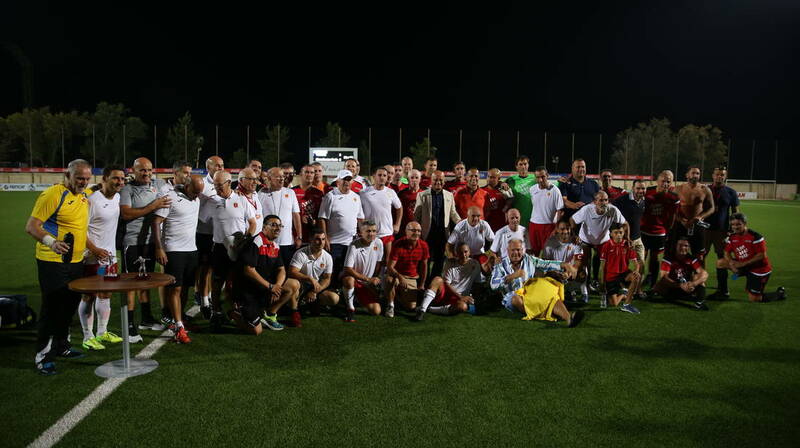 and Manchester Reds Legends XI was held yesterday, 9th September, at the Centenary Stadium in Ta’ Qali. This football game, organized by the Valletta 2018 Foundation in collaboration with the Manchester United Supporters’ Club Malta and Valletta Football Club, was a great success, with all tickets sold within a few days. All proceeds will go towards the crèche of the Ursuline Sisters of Angela House in Gwardamangia. Valletta F.C. won this game with a score of 3-2. Carmel Busuttil (il-Bużu) was one of the players invited, playing for Manchester Reds Legends XI. The players on this team, who all played for Manchester United between 1971 and 2008, won several Premier Leagues, FA Cups and Champions Leagues. Among these were Wes Brown, Raimond van der Gouw, Ronny Johnsen, Jonathan Greening, Lee Martin, Chris Casper, Andy Ritchie, Sammy Mcllroy, Keith Gillespie, Danny Webber, Ben Thornley, Arthur Albiston, Russell Beardsmore, Nick Culkin, and manager Jimmy Greenhoff. Victoria Ajax striker Malcolm Licari also joined this team as a guest player. Valletta F.C. Assistant Manager Gilbert Agius. Other players were Sean Sullivan, Ray Mifsud, Joe Camilleri, Jeffrey Chetcuti, Stefan Giglio, Nardu Farrugia, Keith Fenech, Frankie Grima, Joe Zarb, Ivan Zammit, Carlos Dimech, Ray Sciberras, Ian Zammit, Jeremy Agius, Melchior Cremona, Chris Camilleri Shaun Bajada, Joe Micallef and Eddie Vella. Between them, these players have won many Maltese Premier Leagues and Cups. Valletta 2018 extends its gratitude to Valletta F.C. President Mr Victor Sciriha, Manchester United Supporters’ Club Malta President Mr Joseph Tedesco, and each club’s respective committee members, for their cooperation and collaboration to make this exhibition match a success. Visit valletta2018.org and follow the Valletta 2018 Facebook page to keep yourself updated on upcoming activities in the Cultural Program of the European Capital of Culture.